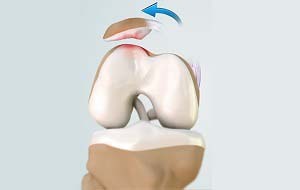 Improper muscle balance: Weak quadriceps (anterior thigh muscles) can lead to abnormal tracking of the patella, causing it to subluxate or dislocate. Patellofemoral instability causes pain when standing up from a sitting position and a feeling that the knee may buckle or give way. When the kneecap slips partially, or completely, you may have severe pain, swelling, bruising, visible deformity and loss of function of the knee. You may also have sensational changes such as numbness or even partial paralysis below the dislocation because of pressure on nerves and blood vessels. Your doctor will recommend pain medications to relieve pain. To help reduce the swelling you will be instructed to elevate the leg and apply ice packs over the knee. Crutches are necessary for the first few weeks to prevent weight bearing on the knee. A knee immobilizer may be used to stabilize the knee. You will be instructed about the activities that should be avoided and exercises to be performed for a faster recovery. A rehabilitation program may be advised for a speedy recovery.